This article is about concepts called Darwinism. For biological evolution, see evolution. For modern evolutionary theories, see Modern synthesis. For Wallace's defence of the theory of natural selection, see Darwinism (book). Darwinism is a theory of biological evolution developed by the English naturalist Charles Darwin (1809–1882) and others, stating that all species of organisms arise and develop through the natural selection of small, inherited variations that increase the individual's ability to compete, survive, and reproduce. Also called Darwinian theory, it originally included the broad concepts of transmutation of species or of evolution which gained general scientific acceptance after Darwin published On the Origin of Species in 1859, including concepts which predated Darwin's theories. It subsequently referred to the specific concepts of natural selection, the Weismann barrier, or the central dogma of molecular biology. Though the term usually refers strictly to biological evolution, creationists have appropriated it to refer to the origin of life, and it has even been applied to concepts of cosmic evolution, both of which have no connection to Darwin's work. It is therefore considered the belief and acceptance of Darwin's and of his predecessors' work—in place of other theories, including divine design and extraterrestrial origins. English biologist Thomas Henry Huxley coined the term Darwinism in April 1860. It was used to describe evolutionary concepts in general, including earlier concepts published by English philosopher Herbert Spencer. Many of the proponents of Darwinism at that time, including Huxley, had reservations about the significance of natural selection, and Darwin himself gave credence to what was later called Lamarckism. The strict neo-Darwinism of German evolutionary biologist August Weismann gained few supporters in the late 19th century. During the approximate period of the 1880s to about 1920, sometimes called "the eclipse of Darwinism", scientists proposed various alternative evolutionary mechanisms which eventually proved untenable. The development of the modern synthesis in the early 20th century, incorporating natural selection with population genetics and Mendelian genetics, revived Darwinism in an updated form. 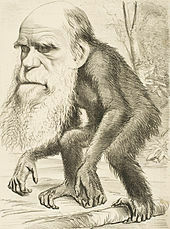 As evolution became widely accepted in the 1870s, caricatures of Charles Darwin with the body of an ape or monkey symbolised evolution. More individuals are produced each generation than can survive. Phenotypic variation exists among individuals and the variation is heritable. Those individuals with heritable traits better suited to the environment will survive. When reproductive isolation occurs new species will form. 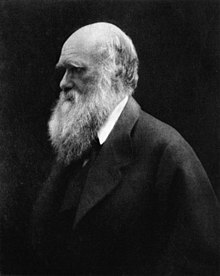 In Darwin's day there was no rigid definition of the term "Darwinism", and it was used by opponents and proponents of Darwin's biological theory alike to mean whatever they wanted it to in a larger context. The ideas had international influence, and Ernst Haeckel developed what was known as Darwinismus in Germany, although, like Spencer's "evolution", Haeckel's "Darwinism" had only a rough resemblance to the theory of Charles Darwin, and was not centered on natural selection. In 1886, Alfred Russel Wallace went on a lecture tour across the United States, starting in New York and going via Boston, Washington, Kansas, Iowa and Nebraska to California, lecturing on what he called "Darwinism" without any problems. However, Darwinism is also used neutrally within the scientific community to distinguish the modern evolutionary synthesis, sometimes called "neo-Darwinism", from those first proposed by Darwin. Darwinism also is used neutrally by historians to differentiate his theory from other evolutionary theories current around the same period. For example, Darwinism may be used to refer to Darwin's proposed mechanism of natural selection, in comparison to more recent mechanisms such as genetic drift and gene flow. It may also refer specifically to the role of Charles Darwin as opposed to others in the history of evolutionary thought—particularly contrasting Darwin's results with those of earlier theories such as Lamarckism or later ones such as the modern evolutionary synthesis. In evolutionary aesthetics theory, there is evidence that perceptions of beauty are determined by natural selection and therefore Darwinian; that things, aspects of people and landscapes considered beautiful are typically found in situations likely to give enhanced survival of the perceiving human's genes. ^ Wilkins, John (21 December 1998). "So You Want to be an Anti-Darwinian: Varieties of Opposition to Darwinism". TalkOrigins Archive. Houston, TX: The TalkOrigins Foundation, Inc. Retrieved 19 June 2008. ^ "…on what evolution explains". Expelled Exposed. Oakland, CA: National Center for Science Education. Retrieved 15 November 2015. ^ Le Fèvre, Olivier; Marinoni, Christian (6 December 2006). "Do Galaxies Follow Darwinian Evolution?" (Press release). Marseille, France: European Southern Observatory. eso0645. Retrieved 15 November 2015. ^ a b Huxley, T.H. (April 1860). "ART. VIII.—Darwin on the Origin of Species". Westminster Review (Book review). London: Baldwin, Cradock, and Joy. 17: 541–570. Retrieved 19 June 2008. What if the orbit of Darwinism should be a little too circular? ^ a b Scott, Eugenie C.; Branch, Glenn (16 January 2009). "Don't Call it 'Darwinism'". Evolution: Education and Outreach. New York: Springer Science+Business Media. 2 (1): 90–94. doi:10.1007/s12052-008-0111-2. ISSN 1936-6426. ^ Judson, Olivia (15 July 2008). "Let's Get Rid of Darwinism". The New York Times. New York: The New York Times Company. ISSN 0362-4331. Retrieved 16 November 2015. ^ Sclater, Andrew (June 2006). "The extent of Charles Darwin's knowledge of Mendel". Journal of Biosciences. Bangalore, India: Indian Academy of Sciences / Springer India. 31 (2): 191–193. doi:10.1007/BF02703910. ISSN 0250-5991. PMID 16809850. ^ Moran, Laurence (22 January 1993). "Random Genetic Drift". TalkOrigins Archive. Houston, TX: The TalkOrigins Foundation, Inc. Retrieved 27 June 2008. ^ Hanes, Joel. "What is Darwinism?". TalkOrigins Archive. Houston, TX: The TalkOrigins Foundation, Inc. Retrieved 19 June 2008. ^ Blinderman, Charles; Joyce, David. "Darwin's Bulldog". The Huxley File. Worcester, MA: Clark University. Retrieved 29 June 2008. ^ Schmitt S. (2009). Haeckel: A German Darwinian? Comptes Rendus Biologies: 332: 110-118. ^ Tippett, Krista (host); Moore, James (5 February 2009). "Evolution and Wonder: Understanding Charles Darwin". Speaking of Faith with Krista Tippett (Transcript). NPR. Retrieved 16 November 2015. ^ Wallace, Alfred Russel. (1889). Darwinism: An Exposition of the Theory of Natural Selection, with Some of Its Applications. Macmillan and Company. ^ Johnson, Phillip E. (31 August 1996). "What is Darwinism?". Access Research Network. Colorado Springs, CO. Retrieved 4 January 2007. "This paper was originally delivered as a lecture at a symposium at Hillsdale College, in November 1992. Papers from the Symposium were published in the collection Man and Creation: Perspectives on Science and Theology (Bauman ed. 1993), by Hillsdale College Press, Hillsdale MI 49242." ^ Ropp, Matthew. "Charles Hodge and His Objection to Darwinism: The Exclusion of Intelligent Design". theRopps.com. Chesterbrook, PA. Retrieved 4 January 2007. Paper for CH506: American Church History, Dr. Nathan Feldmeth, Winter Quarter 1997, "written while a student in the School of World Mission at Fuller Theological Seminary, Pasadena, California." ^ Sullivan, Morris (Spring 2005). "From the Beagle to the School Board: God Goes Back to School". Impact Press. Orlando, FL: Loudmouth Productions (56). Retrieved 18 September 2008. ^ Rennie, John (9 April 2008). "Ben Stein's Expelled: No Integrity Displayed". Scientific American. Stuttgart: Georg von Holtzbrinck Publishing Group. ISSN 0036-8733. Retrieved 16 November 2015. ^ Adler, Jerry (28 November 2005). "Charles Darwin: Evolution of a Scientist". Newsweek. 146 (22). New York: Newsweek LLC. pp. 50–58. ISSN 0028-9604. Retrieved 16 November 2015. ^ Sheahen, Laura. "Religion: For Dummies". Beliefnet. Norfolk, VA: BN Media, LLC. Retrieved 16 November 2015. ^ Blackburn, Simon (October 1996). "I Rather Think I Am a Darwinian". Philosophy. Cambridge, UK: Cambridge University Press on behalf of Royal Institute of Philosophy. 71 (278): 605–616. doi:10.1017/s0031819100053523. ISSN 0031-8191. JSTOR 3751128. ^ Franklin, James (January 1997). "Stove's Anti-Darwinism" (PDF). Philosophy. Cambridge, UK: Cambridge University Press on behalf of Royal Institute of Philosophy. 72 (279): 133–136. doi:10.1017/s0031819100056692. ISSN 0031-8191. JSTOR 3751309. ^ "A Darwinian theory of beauty". ted.com. Archived from the original on February 11, 2014. Retrieved May 1, 2018. Hodge, Charles (1874). What is Darwinism?. New York: Scribner, Armstrong, and Company. LCCN 06012878. OCLC 11489956. Retrieved 16 November 2015. Kropotkin, Peter (1902). Mutual Aid: A Factor of Evolution. New York: McClure Phillips & Co. LCCN 03000886. OCLC 1542829. Mutual aid; a factor of evolution (1902) at the Internet Archive Retrieved 2015-11-17. (in Russian) Danilevsky, Nikolay. 1885-1889 Darwinism: A Critical Study (Дарвинизм. Критическое исследование) at Runivers.ru in DjVu format. Lennox, James (26 May 2015). "Darwinism". In Zalta, Edward N. (ed.). Stanford Encyclopedia of Philosophy (Summer 2015 ed.). Stanford, CA: The Metaphysics Research Lab, Center for the Study of Language and Information (CSLI), Stanford University. Retrieved 16 November 2015.